Have you realized that commercially available self-driving cars are touted as one of the greatest innovations in transportation technology? As much as this is an exciting reality, most people aren’t quite ready to accept the idea of sharing a roadway with a non-human driver. A recent road accident involving Uber’s self-driving vehicle in Arizona clearly demonstrated that these cars could get involved in auto accidents just like other cars controlled by human drivers. This has shattered some of the infallibility of the unique software controlling these cars. While the Arizona crash was fairly minor and didn’t cause any injuries, it resulted in Uber suspending its testing of these self-driving cars across the country. Note that Uber isn’t the only organization that is currently testing the self-driving car technology. Recently, Apple Inc. put forward its plans to create and test autonomous vehicle driving software. Tesla and Google have also tested self-driving cars and truck technology too. This, according to the experts, can potentially reduce the number of truck crashes on the United States roadways if the technology is widely adopted. 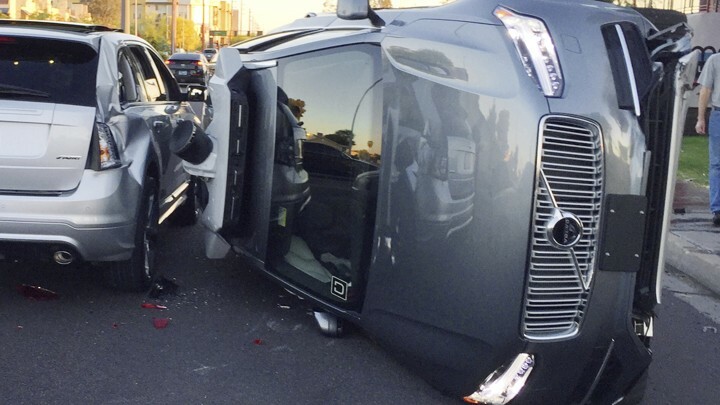 In the Uber incident in Arizona, the driver of the other vehicle was deemed to be responsible for the crash. If there had been passengers in the Uber car that suffered injuries in the incident, these individuals would have filed personal injury lawsuits or claims against the liable driver. Whenever a self-driving vehicle is involved in a crash, it is challenging to establish who was at fault for the crash. In any typical auto accident incident, a driver may be at fault if they are deemed to have negligently acted. These negligent acts may include texting messaging while driving or disregarding posted traffic rules and regulations. Generally, a computer program may not make these mistakes. This makes it difficult to find the computer program, the driver of the self-driving vehicle, at fault for an auto crash. In a case that involves a rideshare organization like Uber, the company could be deemed to the liable party as the driverless vehicle was part of its fleet and that means it is covered by its insurer. But the issue of assigning fault to a self-driving vehicle is a challenging one and one that most insurers and lawmakers will need to establish with time. It is recommended to discuss these issues with a car accident attorney in Seattle. Establishing liability in a vehicle accident caused by self-driving cars will likely involve establishing where the mistake occurred. For instance, a programming mistake could put the car’s developer at fault. A mistake that occurs because of poor vehicle maintenance or manual override might result in the car owner to be held responsible for the crash. Note that this opens the question of whether or not the vehicle’s software developer’s mistakes and faults are separate from the vehicle manufacturer’s fault. If you ever find yourself in some kind of crash involving self-driving vehicles, get in touch with an experienced attorney.